The Graphic Design Archive at Rochester Institute of Technology in New York State has long been an essential resource for anyone with a research interest in the history and evolution of North American graphic design. 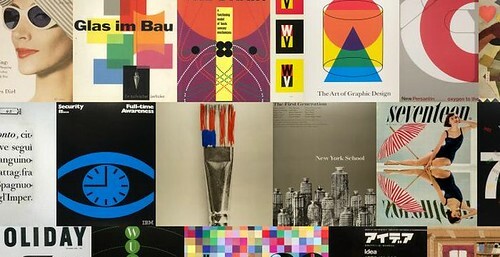 Until now, though, the archive’s treasures have been most visible in books published by RIT professor R. Roger Remington, the driving force behind the collection – Nine Pioneers in American Graphic Design (1989), American Modernism (2003) and studies of Lester Beall (1996) and Will Burtin (2007). In November 2009, RIT launched the Graphic Design Archive Online website, making this graphic mother-lode accessible as never before. The site now lists 36 collections. Some represent a designer’s entire bequest. Lester Beall’s papers, for instance, run to 77 document boxes, 33 oversize boxes, 15 notebooks and 45 posters, and there is a 57-page downloadable ‘finding aid’, a vital research tool listing each item. Other significant designers, such as Paul Rand, Alex Steinweiss and Bradbury Thompson, are represented by smaller sample collections. The original policy was to collect material from American design pioneers who worked between 1930 and 1950, though this was later extended to cover the entire period from the 30s to the present. The youngest designer, Willi Kunz, born in 1943, is a relative newcomer in this group. Biographical information is supplied for each designer, as well as a representative selection of pictures. Ease of image handling is one of the streamlined interface’s most attractive features. Once images are open they can be dragged around the screen as required, leaving the biography and other image links still visible, and several images can be open at the same time as an aid to comparative study. Processing a complete archive after donation is a major undertaking. RIT received the papers of the Italian émigré George Giusti (1908-90) from his wife, Margo Giusti, in 1993. These were not put in order until 2005, when a grant from the National Endowment for the Arts made this possible; there is now an 80-page finding aid. In 2009, 40 items from the archives of Giusti and Fred Troller (1930-2002), a Swiss émigré, were loaned to the exhibition ‘Good Design, Good Business: Swiss Graphic Design and Advertising by Geigy, 1940-1970’ at the Museum für Gestaltung in Zurich (reviewed in Eye 72). Reappraisals of this kind, vital for our understanding of design history, are only possible thanks to the committed conservation work undertaken by archives such as RIT’s. Even for the casual visitor there is much to enjoy. There is a beautiful cover by Troller, constructed from overlapping street signs, for a 1965 issue of the Geigy Catalyst journal. The collection of Louis Danziger (born 1923) contains a brilliant invitation to an exhibition by the New York School of artists, in which a set of vertical paint tubes become skyscrapers photographically filled with the facades of buildings. In Using Aluminium for Industrial Purposes, a promotional design by Ceil Smith Thayer (1900-88), proto-Pop Art outline drawings of machine parts float across the silhouette of a factory – the image is as fresh as it is unfamiliar. Like many pieces shown on the site, it hasn’t been given a date, though surely an approximation would be possible? It appears to be from the 1930s. 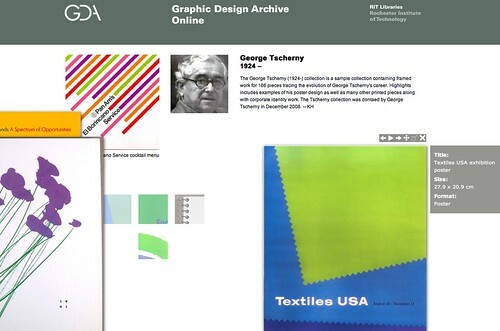 Top, Below: The Graphic Design Archive Online website. The site offers barely any information about Thayer, who worked in advertising agencies, department stores, the corporate world and publishing. Though little is probably known about her at this point, there are inconsistencies elsewhere in the amount of biographical information supplied, and the bibliographies could sometimes be more pertinent. The page for E. McKnight Kauffer, for instance, cites the brief entry about him in the Livingstons’ dictionary, but omits to mention Mark Haworth-Booth’s biography (reissued by the V&A in 2005 and reviewed in Eye 59). Doubtless the site’s editors will in time address such gaps like this. I asked Remington – now the Massimo and Lella Vignelli Distinguished Professor of Design at RIT – how the archive had developed. He says the institute had ‘systematically and doggedly gone after collections’. Then, once the archive was established, it began to receive offers from the families of deceased designers. All the collections have been donated, rather than bought. Occasionally, Remington has turned down offers from minor figures, and this is as it should be. The collections occupy valuable storage space and there is no point in keeping material that hasn’t made a notable impact on the field and is consequently unlikely to be of interest to future researchers. The website already indicates a vast amount of material available for scholarly investigation. This spring the archive will attract even more attention, and there will be space for additional collections, when the new Vignelli Center for Design Studies building opens on the RIT campus.